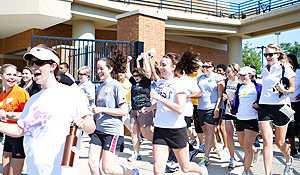 Ladies, make plans now to attend the 15th annual Wake Forest Women’s Football Clinic presented by Bo-Ty Florist on Saturday, August 4, from 9 a.m. to noon. This year’s event will be held on the 4th floor of Deacon Tower and will feature breakfast, a fashion show, football drills & instruction, door prizes and more! Cost is $40 per person. To register, please call Wake Forest Sports Marketing at 336.758.3874.